You know what that red star means, don't you? War! The Jollyroger CODE Killers corporation pledged itself to the goal of destroying the mighty CODE. alliance. Unlike most of the thousands of other carebear corps over the years that have made similar pledges, Jollyroger CODE Killers backed theirs up with a wardec. The corp only had three members, but one of them was Redleg Lachle, and he seemed serious enough. At any rate, Agent Super Perforator actually managed to come across Redleg's name in local, so there was a Jollyroger CODE Killers presence somewhere. The Poinen system, once a bustling hub of activity, was quiet. 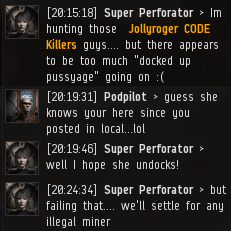 A lonely miner named Podpilot pinged local. An hour later, there was only silence. Agent Super Perforator took pity on the solitary miner and struck up a conversation with him. She, too, was looking for someone. Since her war target was staying docked up, our Agent would have to find another way to get her kicks and enforce her Code. In an ironic twist of fate, Super Perforator ended up killing Podpilot himself. He was at the helm of a rare Power Diagnostic System-tanked Hulk. Why would you expect the miner to know any better? 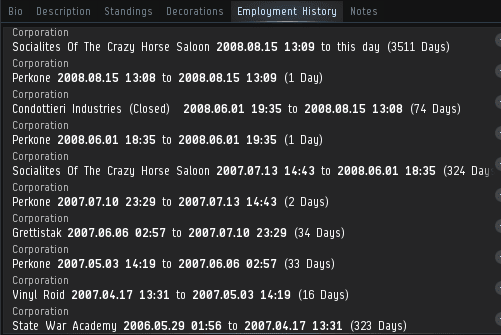 He's only been playing EVE for 12 years, and highsec mining has a steep learning curve. 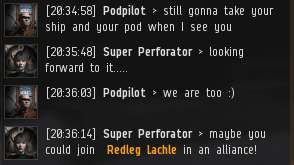 The lonely Podpilot had finally found someone to play EVE with. He discovered that he didn't enjoy it. He was a bot-aspirant. Even so, Super Perforator was the only player who cared enough about Podpilot to shoot him. 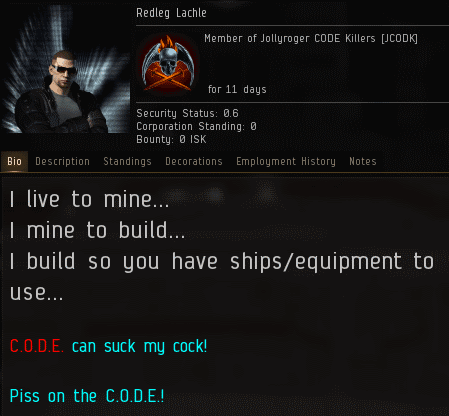 If the miner learned how to PvP, maybe he could get some revenge and make his 12-year stint in EVE worth it. Our Agent has heard enough threats over the years to know when they're empty. Generally speaking, when they come from people who tank their Hulks with Power Diagnostic Systems, they're empty. But Super saw an opportunity to do a little matchmaking. 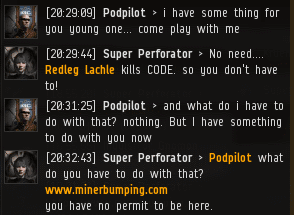 Maybe Podpilot could become the fourth member of Redleg's anti-Code corp. In the end, Super's initial instincts would prove correct. Podpilot never did manage to get his revenge, or to make any serious effort at seeking it. They say there's someone for everyone. But the truth is, without the Code, there's nothing for a miner to look forward to but pain, emptiness, and regret. 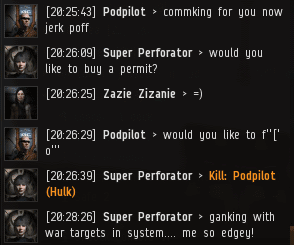 Mining permits are currently on sale for 10 million isk. if only they didn't have someone embezzling all the donations like Thomas currently is. such a shame. How are those kids you never see Wolfie? It's either "The Code" or "CODE." you carebears, at least learn what you're mad about. lol gtfo of highsec and it would be easier to identify and kill the bots. If you are mad at highsec gankers it's because you are trying to play EVE wrong. "He's only been playing EVE for 12 years, and highsec mining has a steep learning curve." Another quality report by our Saviour! Another quality encounter by Super! This particular carebear has barked at me from the sidelines before and boasted about how his long years have made him wise. No excuses for him. ﻿[ 2018.03.01 17:22:20 ] Podpilot > Turn coat! ﻿[ 2018.03.01 17:22:33 ] Pew Pew Pop > Turncoat? ﻿[ 2018.03.01 17:22:39 ] Pew Pew Pop > who did i betray? ﻿[ 2018.03.01 17:22:52 ] Pew Pew Pop > where does it say high sec is free? 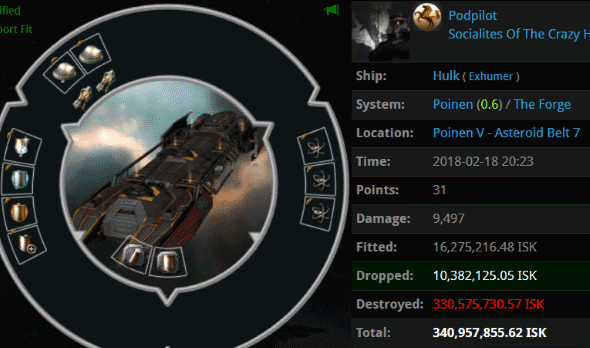 ﻿[ 2018.03.01 17:23:38 ] Pew Pew Pop > my mining vessel? ﻿[ 2018.03.01 17:23:42 ] Pew Pew Pop > are you for real? ﻿[ 2018.03.01 17:24:08 ] Sourr Deezz > Nerd Fight! ﻿[ 2018.03.01 17:24:32 ] Pew Pew Pop > time matters? ﻿[ 2018.03.01 17:24:43 ] Pew Pew Pop > you are good and wise cuz you played longer?